I don't know who John Denton is but thanks for the flicker of light in this morning's DomPost which has become a bereft bastion of the economically deluded of late. I have missed Justin du Fresne from the time he retired from the morning NewstalkZB talkshow. In fact, I've never found another talkback home. When you work alone you need company and Justin was the best. His wit and his warmth made the perfect blend. His broadcasting professionalism and interviewing prowess are becoming rare commodities. My deepest commiserations to his family. On his last show of 2008 Justin read the full Desiderata poem to some very beautiful and ethereal music. Barely anyone could have gotten away with it. Or pulled it off. But he did. Thank you Justin for so much zest, curiosity, acumen and humour. On behalf of NZ Catholic Bishops, the writer says all opinions are equal ... and then says they aren't. “All views on assisted suicide matter” says Catholic Bioethics Centre spokesperson. Director of The Nathaniel Bioethics Centre, Dr John Kleinsman, is surprised and appalled at the disingenuous tactics being employed by assisted suicide supporters. Both Matt Vickers and Act MP David Seymour have in recent days described the unprecedented number of submissions to the Health Select Committee and the overwhelming 78% opposition to a law change as nothing more than the result of formulaic submissions collected in bulk by mostly religious institutions or as religious bullying from the pulpit by pastors. “Their insinuations are two-fold: (i) that the only possible basis for opposition is a religious one and (ii) that the views of people with a faith perspective don’t count or count less,” says Dr Kleinsman. “It is actually impossible to know the precise numbers of submitters whose views on assisted suicide may be influenced by their faith. One analysis of the submissions shows that approximately 17% of opponents and 4% of supporters of a law change drew on religious concepts,” said Kleinsman. 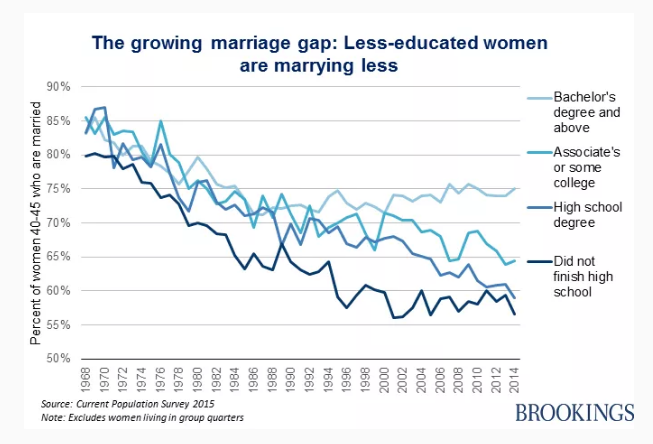 "Educated Americans have not turned their backs on marriage; the well-documented “marriage gap” is mostly due to a decline in marriage rates among the less educated. As a general rule, the more letters American women have after their names—and therefore the greater their economic independence—the more likely they are to be married." That bottom line is interesting. Seems arrested, as is the top line. 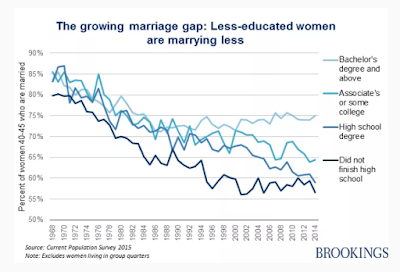 In the past, highly-educated women faced an unenviable choice between accepting a patriarchal marriage or forgoing marriage and children entirely. Now they are able to raise their children within a stable marriage without compromising their independence. In the past there were very few "highly educated" women. There were smart women but not many went to university and I reject that its known what was going on inside other people's marriages anyway. I wasn't raised in a 'patriarchal' family' and neither was my husband. Men compromised their independence too. The role of sole breadwinner in most marriages tied them to jobs and careers they may not have wanted. That always seems overlooked in the feminist dialogue. "For 14 days and 14 nights Elijah Saitu, 15, has lived in a damp motel room, bordered by KFC to the left and a Denny’s 24-hour takeaway to the right. He spends his days watching music videos on television and eating white bread, tinned sardines, fizzy drinks and packets of chips. “He’s suffocating,” says Elijah’s mother, Emily Fiame Saitu, who has been begging the government to help her family. The Saitu family are a tragic portrait of New Zealand’s most shameful national secret: an epidemic of child poverty that belies the image of a Pacific haven offering equality of opportunity and a prosperous, clean, healthy life of plenty for all." "We are concerned that recent media coverage on the Saitu family misrepresents their situation, and disregards vital details on work the Ministry of Social Development and Housing New Zealand have done to find a solution for this family. Last Thursday they were offered a property within their preferred area, close to their support network, with necessary modifications including wheelchair access. They have accepted this offer, and Housing New Zealand will continue to work with them to arrange a move-in date. Family circumstances and the medical conditions of the children meant the family had very specific housing requirements. These requirements, along with the need to find a house in South Auckland, an area of high housing demand, meant a suitable property was not immediately available. The Saitu family first approached us for emergency accommodation help in late May of this year. They had been living with family following their return to New Zealand from Australia in April. We granted over $8000 for one-month’s motel accommodation, and they were placed on the social housing register on 28 June as a high priority. Since then we have been in close contact with the family’s agent - to discuss both social and private housing options, what support is available to move, and ensuring they continue to receive their full and correct benefit entitlement. It is disappointing that their case has been presented as an example of a family falling through the cracks – they’ve received significant assistance from government agencies, the community, and their agent, who has indicated they have been happy with the support offered. We’ve worked closely with housing providers to get a solution, and find a house." JC just reminded me I had a couple more teed up to go. Life expectancy isn't discriminating. 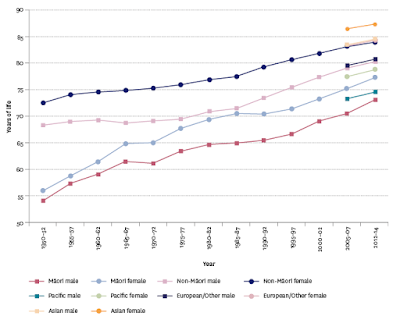 It is rising across every ethnicity. The gain that Maori males and females have made is a real eye-catcher - all against a backdrop of colonisation, poverty and unemployment. Oh, have I got that right?